With real Bugatti 57s fetching literally millions on the auction block, it's unreasonable to consider one as a daily driver. Today's Nice Price or Crack Pipe Repligatti could get you to and fro without fear, but is its price too much to throw at a fake? Taking a car penned by a venerated design house and monkeying with its lines is not likely to end well, and as 89% of you agreed, yesterday's customized 1975 Ferrari 308GTB4's aesthetic mods were not for the better. That 2+2's re-imaginer cast originality to the wind in envisioning his creation, while the builder of today's candidate has strived to be as true to the original as possible in his. For $44,000, is this 308 better red than dead? Jean Bugatti, son of founder Ettore Arco Isidoro Bugatti, was but 26 when he oversaw the creation of the company's Type 57. Like many pre-war cars targeting the upper crust, the 57 was a chassis and drivetrain, upon which a coachbuilt body of preferred specifications could be mounted. Elegant coupés, stately sedans, and imposing dropheads featured among the 710 57s constructed, however one bodystyle above all has made the 57S one of the most memorable of Bugattis, that of the Atlantic. Today's replica Type 57S seeks to emulate the Atlantic, and the claimed two and a half years of construction appear to have been well spent. The original 57S Atlantic (S for surbaissé, or lowered) featured magnesium and aluminum alloy bodywork, which required it be riveted together much like the airframe of fighter plane. The sweeping fenders, tapering rear deck and aircraft style cockpit of the original Atlantic took their cues from the 1935 Aérolithe Electron concept, and are here rendered seemingly faithfully. It's unlikely that the builder of this tube and boxed steel framed replica has gone so far as to clothe it in the original's mag-alloy, and in fact the listing fails to detail whether its achingly beautiful shape has been rendered in aluminum, steel, or, god forbid, fiberglass. Whatever it is, it's breathtaking in execution. The interior is awash in the knees of ostriches, the bird hide covering both the two flat bucket seats, and the interior panels of the butterfly doors. The rest is done up with gray carpet and mats while - somewhat jarringly - the plank used to mount the Jaegers looks a little too much like an old surfboard than it probably should. Springing forth from that is a chrome and wood steering wheel on the right, while tightly coupled beneath is a similarly presented spindly shift lever. That shifter is connected to a 4-speed box, likely a Moss, as fronting the transmission is not the Type 57S' 3,257-cc straight eight with its dry sump and gear driven twin-cam head. Instead this replica is powered by a 3.8-litre DOHC straight six sourced across the channel from Jaguar. Twin Skinners Union side-draughts provide induction, while exhaust is handled by the ubiquitous Jag three into two cast headers, here polished rather than ceramic-coated. The valve covers have been replaced with boxy machined pieces to extend the illusion, and hopefully hide the fact that the car is down a pair of pots. This 57S may not be the real deal, but with the few actual Atlantics out there currently squirreled away by people like Ralph Lauren, and commanding millions of dollars to buy when one does occasionally escape to Bonhams and the like, it's unlikely that even those of modest means will ever own one. But for the cost of a new Aston Martin, this one could provide probably 90% of the experience, and without the anxiety that driving a multi-million dollar car made out of unobtainium can engender. At $208,583, this Bug does not come cheap, but then again in comparison to the real deal, it does. It's also drivable without trepidation, and is as knuckle-bitingly beautiful as its source. But is that price reasonable for what is in the end a counterfeit? 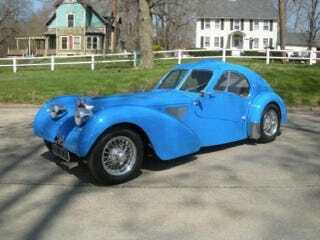 Do you think someone should spend that much for this not a Bugatti? Or, should that price only be paid with a forged check? Jameslist wealthgasm or go here if the ad disappears. H/T to MasAer for the hookup!